Pledge to our One Last Party campaign this weekend and win a signed copy of The Children of Hurin! Our One Last Party giveaway had such a huge response that, to celebrate J.R.R. Tolkien’s birthday (born January 3 1892, folks! ), we’ve decided to hold another for all those who pledge $10 or more between now and 6pm EST on Monday January 5! The prize is pretty fab: a hardback copy of J.R.R. 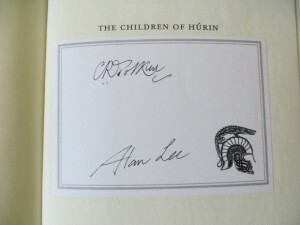 Tolkien’s The Children of Hurin — signed by illustrator Alan Lee and editor Christopher Tolkien. Only J.R.R. Tolkien, the undisputed master of the fantastic, could have conceived this magical tale of Elves and Men united against a brutal foe. And only Christopher Tolkien, the master’s son and literary heir, could have fit the pieces of his father’s unfinished work together with such deep understanding and consummate artistry. 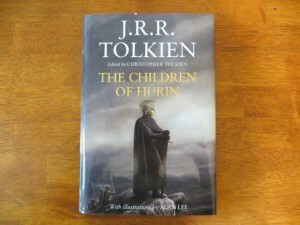 With an introduction and appendices from Christopher Tolkien, who has also contributed maps and genealogy tables, and eight stunning paintings and twenty-five pencil drawings by Oscar-winning artist Alan Lee, The Children of Húrin at last takes its proper place as the very cornerstone of J.R.R. Tolkien’s immortal achievement. To be in with a chance to win this item, you simply need to make a pledge of $10 between now and 6pm EST, Monday January 5. You don’t even need to pick a perk, you can simply make a contribution — and every little bit helps us reach our goal! Names will be entered into the draw for as many times as an individual has pledged -– so if you’ve pledged twice, you have two chances to win! One name will be drawn at random and the winner will be notified by email, and the book shipped out to that lucky person asap. This means that the winner will receive the book no matter the final result of our campaign. And if you need any further persuasion to join the party, here’s a video where Billy Boyd chats with staffer greendragon. Towards the end of the interview, he talks about the music he’d like to play at the party; let’s make it happen, so Billy can come and serenade us all! #OneLastParty – see you there!